Meribel Catered Chalets in Meribel Meal Deliveries Meribel Village Getting To Meribel Meribel Skiing Webcams Snow Forecasts Questions about Meribel? Welcome to Meribel, one of Europe's Top ski resorts. Meribel is the Central valley of the world famous Les Trois Vallees (The Three Valleys) ski area, one of the best ski areas in the world and on the to-do list of any serious skiier or snowboarder. Being the main hub of the central valley, Meribel makes the ideal base for exploring the whole of the Three Valleys ski area. High speed lifts whisk you quickly up the mountain in all directions. The skiing here is famous for many things, but notably it's incredible lift infrastructure, mile after mile of wide open runs at all levels, and the world renowned off-piste. 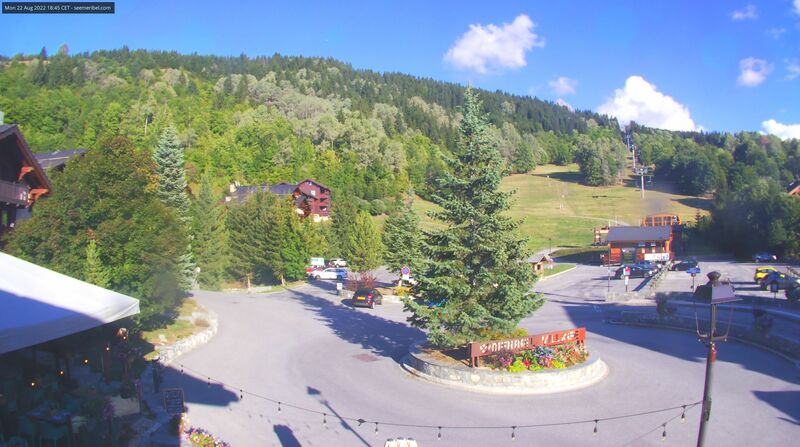 Our ski chalet is in Meribel Centre, which is where the main ski hub is. From here you can jump on a lift in any direction - towards Courchevel, La Tania, Val Thorens, St Martin de Belleville and more! Meribel Centre is also the main apres-ski village too - there's a great collection of bars for all tastes, from dancing in your ski boots to live bands to relaxed quite drinks and everything inbetween. If you are looking for the very best in luxury catered chalets, then Chalet La Chouette is for you. Overlooking the Meribel Valley, this stunning chalet has been appointed to the very highest standards. If you are looking for a stunning catered ski chalet with amazing living spaces, then Chalet Belmont is the right choice. At the end of a quiet cul-de-sac with incredible views the length of Meribel Valley, Chalet Belmont offers the luxury experience throughout. Meribel is one of the few modern French ski resorts that was build in keeping with it's traditional savoyard routes. It's charm and charactor sets it apart from other modern ski resorts. Yes being a purpose build resort, the direct access to the skiing is just incredible. Slopes from all directions funnel down to Meribel Centre, to a point called La Chaudanne. From here there's high speed lifts running in all directions. Meribel has a great apres-ski scene. If you like lively apres-ski, dancing in your ski boots, then there's a great selection of bars for you. You'll find live music every day of the week & plenty of friendly revellers out enjoying it all. There's also plenty of more relaxed bars - if your perfect apres-ski is a few relaxing drinks in a friendly bar, then you'll find plenty to your taste as well. Just ask us, we'd be happy to point you to a few of our favourites. There is a good range of childcare options and ski schools in Meribel for you to pick between, and as always we are more than happy to help make some recommendations for you! We have worked with Nanny Helen for the past 4 years and can't recommend her enough. Nadine who runs Snowbugs has built up a successful team of nannies of which we only here good reports. Summit Photography is an action photography company based in Meribel. After the shoot all images are edited and supplied via a private online gallery, after which prints can be ordered at your leisure. Please get in touch for a tailored quote. Geneva airport is our main hub and that's about 2.5 hour's drive away. There are several transfer companies that serve Meribel, please just get in touch and we'd be more than happy to help with some recommendations of good transfer companies to whisk you up to Meribel. A closer option is Chambery Airport, though being a small local airport the choice of flights is a bit more limited. That's about 1.5 hours drive from Meribel.. The snow train stops in Moutier, which is just 30 mins drive from the ski chalet! If you are staying with us we'd be more than happy to come and pick you up, for free. Please just let us know when you book & nad we'll get that all sorted for you. Meribel is about 10 hours driving time from Calais, with all but the last 30 minutes being on the very good French motorway system. Top tip - there are two routes; one via Paris, and the over via Reims and Troyes. Take the latter, it's both much quicker and easier. There is parking by Chalet la Chouette (though please let us know if you are driving so we can hold your space for you!). Why does the Three Valleys always top the polls for World's Best Ski Area? Where to start with that one! It is a truly incredible ski area on many fronts, but I'll try and break it down a little. Motorway skiing as it's often called, the terrain here is perfect for wide open slopes that go on and on. If you like cruising wide blues and reds, then this will be your dream ski resort. The off-piste possibilities here are just about endless, and so much of it is lift accessible. The area is both expansive and goes very high, and so it has some of the best power skiing in Europe. We'd always recommend a good guide though (we'd be more than happy to book some for you), both to keep you safe and to show you the best places to go. The Three valleys does not (quite) have the title of the worlds largest amount of pistes, but you could argue it has the largest about you can ski without taking your skis off. The interconnection of all the villages and different areas here is wonderful. The whole area has been planned so you can just keeping skiing - into one village, through and up to the next. No connecting buses here! Meribel is the middle valley of the three, and so makes the ideal base to get to explore the whole area. We have another website purely dedicated to our chalet holidays in Meribel. There's much more information on that website about Meribel's skiing, including lift pass prices, ski hire options and more. You might also like to visit AWE365 to find out about snowboarding holidays	this winter. 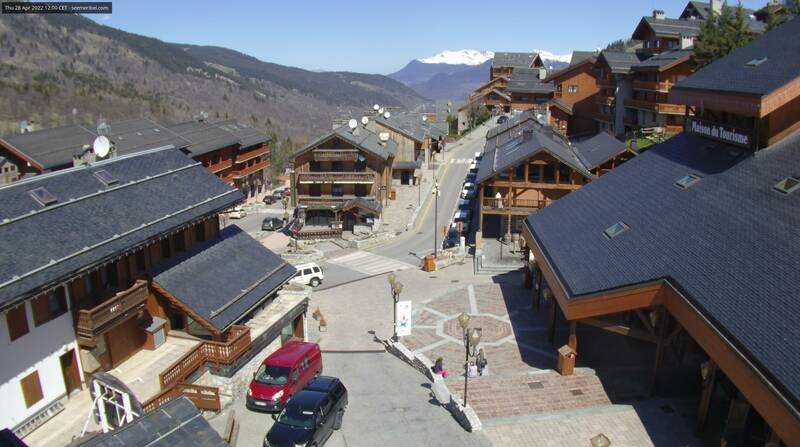 Here you can see Meribel Village Centre.